Ryne Sandberg is the greatest player to ever play second base! ... and now a Hall of Famer! yne Sandberg was born in Spokane Washington on September 18, 1959. He was named after Ryne Duren, a Yankees relief pitcher. In high school, Sandberg excelled in three sports, football, baseball, and basketball. As an all-american quarterback, he was recruited by the Washington State University (Cougars) and signed a letter of intent to play football and baseball. However, Bill Harper, a Philadelphia Phillies scout convinced the organization to draft Sandberg in the twentieth round of the 1978 amateur draft. On June 16, 1978 Sandberg signed his first professional contract with the Philadelphia Phillies and received a $24,000 bonus. Sandberg was initially assigned to the Phillies rookie ball team in Helena, Montana where he played shortstop and hit .311 (~ .393 OBP) in 56 games with 15 stolen bases. In 1979, Sandberg married his first wife Cindy White while playing "A Ball" in Spartanburg, South Carolina. Although Sandberg struggled a bit in Spartanburg, hitting .247 (~.327 OBP) in 138 games, he was promoted to AA Reading, Pennsylvania in 1980. Sandberg continued to excel in Reading, hitting .310 (~.400 OBP) and swiping 32 bases. In 1981, Sandberg was again promoted, this time to the Phillies AAA team in Oklahoma City. In 133 games, Sandberg hit .293 (~.353 OBP) while stealing 32 bases. In late September 1981, Sandberg broke into the big leagues and recorded his first hit (at Wrigley Field). "Ripken's first major award was the 1982 rookie of the year, an outstanding achievement considering the quality of that year's rookie class, one of the best ever. That group produced three certain Hall of Famers (Ripken, Tony Gwynn and Wade Boggs), a fourth probable Hall of Famer (Ryne Sandberg) and many very, very good players. All told, the 1982 rookies won 15 batting titles, four MVPs, produced three members of the 3,000-Hit Club and two Cy Young winners." excerpt from "Get me a hot dog and a Calculus Book" Jim Caple. In June 1981, the Chicago Cubs were sold to the Tribune Company, which hired Dallas Green away from the Philadelphia Phillies to become the Cubs new General Manager. In January, Green made the best trade of his career and brough Larry Bowa to the Cubs for Ivan DeJesus. Green insisted on a minor-league shortstop named Ryne Sandberg as a throw-in, and got him. However, Sandberg found himself in the same situation as in Philadelphia when he arrived at the Cubs spring training in Mesa, Arizona: Sandberg was stuck behind the same All-Star shortstop - Larry Bowa. Towards the end of the 1982 spring training, the Cubs released their starting third baseman, Ken Reitz and moved Sandberg to third. 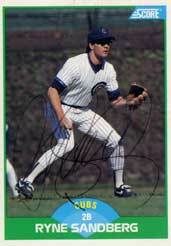 Ryne Sandberg began the 1982 season as the Cubs everyday third baseman. On April 13th, he got his first hit as a Cub, but started just 1 for 32. During his rookie year, he played 133 games at third base, committing 11 errors. He also played 24 games at second base, committing only 1 error. At the plate, Sandberg batted .271, while playing in 156 games. As a rookie, he hit 7 home runs and drove in 54 runs, while stealing 32 bases and scoring 103 runs. Following his rookie year, Sandberg placed 6th in the 1982 National League Rookie of the year voting, behind Steve Sax, Johnny Ray, Willie McGee, Chili Davis, and Luis DeLeon. Early observers believed Sandberg would develop into a slap hitter with speed, a good glove, and a versatile infielder. However, in 1983, the Cubs acquired Ron Cey and moved Ryne Sandberg to second base. He started in 157 games, committing 13 errors, and winning the Rawlings Gold Glove award at second base. 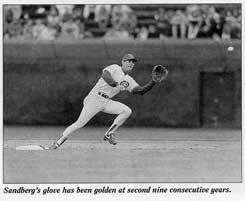 Sandberg was the first Cub to win a Gold Glove since Don Kessinger in 1970. Ryne Sandberg's 9 Gold Gloves are more than any other Cub. In their history, the Cubs have won 31 Gold Gloves. Offensively, Sandberg continued to hit the ball on the ground, and use his speed to leg out hits. He hit .261 as a sophomore, but developed a better understanding of the strikezone, increasing his walks from 36 to 51. Despite a .010 point drop in batting average, his OBP increased from .312 to .316. On the basepaths, Sandberg continued to use his speed stealing 37 bases to help the Cubs manufacture runs. For the second consecutive year, Sandberg led the team in runs scored with 94 in 1983. When Sandberg reported to Mesa, Arizona for spring training in 1984, the Cubs coaches decided to change his swing and helped him to begin hitting for power, rather than slap-hitting. The end result transformed Sandberg into a "5 tool" player in 1984. Sandberg hit 19 home runs, 19 triples (which led the league), and 36 doubles. His slugging percentage jumped from .351 in '83 to .520 in 1984. Despite the added power, Sandberg continued to use his speed by stealing 32 bases and scored a league leading 114 runs. His batting average climbed to .314 and his OBP elevated to .367. He finished the year with 200 hits, and also drove in 84 runs from the second spot in the batting order. Throughout the season, Sandberg combined with Bobby Dernier to form the Cubs' "daily double" which catalyzed the league leading '84 offense as it scored 762 runs (4.7 runs per game). On June 23rd, 1984 the Cubs met the Cardinals at Wrigley Field to play a Saturday afternoon game, which was being broadcast nationally as the game of the week. The Cardinals jumped ahead to a 7-1 lead after the second inning, but the Cubs kept coming back and closed the gap to a one run Cardinals lead heading into the bottom of the ninth. Sandberg lead off the inning with a home run off the Cardinal's Bruce Sutter, to send the game to extra innings. In the tenth inning, Sandberg faced Sutter again with the Cubs down 11-9. Sandberg hit his second home run of the afternoon, this time with Bobby Dernier on base to tie the game again at 11. In the eleventh inning, the Cubs pushed across a run and the Cubs won 12-11. The game has been named simply "The Sandberg Game," and for good reason: Sandberg finished the game 5 for 6 with 7 RBI, 2 runs scored, and 2 home runs. Entering the Sandberg game, the Cubs were 1.5 games behind the first place Mets. The come from behind victory sparked the Cubs to a strong finish, and they won the National League East Division championship. The 1984 campaign marked the Cubs first trip to the Playoffs since 1945, and Sandberg lead the team throughout the season. The end of year awards voting results reflected Sandberg's tremendous '84 season and he won his second consecutive gold glove, and the National League MVP award. Additionally, Sandberg had been elected as the starting second-baseman for the National League All-Star squad, an honor that would be bestowed on Sandberg nine more times in his career. As winners of the National League East, the Cubs met the Padres in a best of 5 series, where Sandberg batted .368 with a .455 OBP scoring 3 times, driving in 2 runs, and stealing 3 bases. Despite his strong performance, the Cubs lost the series in 5 games. Sandberg started the 1985 season in a slump, batting .192 in April, but caught fire in early May raising his average to .257 in the first 17 games in May, he continued to hit well the rest of the season, finishing with a .305 AVG and a .364 OBP. On the basepaths, Sandberg was swiping sacs with increasing regularity. In mid August, Cubs manager Jim Frey moved Sandberg from the second spot in the batting order to the 3 hole. Sandberg responded by hitting .332 with 11 home runs and 42 RBI in the final 52 games of the season. Ryno, as his teammates and fans called him, finished the '85 season with 54 stolen bases, and was caught only 12 times (82%). His team high 113 runs was fourth in the league, 5 behind Dale Murphy of the Atlanta Braves. Sandberg also finished fourth in the National League in Hits (186), Total Bases (307), and Stolen Bases (54), while finishing fifth in extra base hits (63). More importantly, Sandberg's power game was beginning to take shape. He followed up a 19 home run season with 26 blasts in 1985. Sandberg's mix of power and speed were first in the National League in '85 and just slightly behind Rickey Henderson of the Yankees. While the Cubs were preseason favorites to return as NL East champs in 1985, numerous injuries to the pitching staff kept the team from competing for the NL East crown. However, Sandberg continued developing his power and speed game. He belted 26 home runs and stole 54 bases in 1985, while batting .305, scoring 113 runs, and driving in 83. He earned his third consecutive gold glove, and finished the season on a hot-streak batting .332 with 11 homers and 42 RBI in his final 52 games. The 1986 season was a difficult year for Sandberg as his power and speed production declined. However, his fielding improved as he won another Gold Glove, and had his best fielding season of his career. In 154 games, Sandberg led National League secondbasemen in assists for the third time in his career with 492 assists, while committing only 5 errors. He had three errorless streaks of 35 games or more during the year, resulting in a .994 fielding percentage. While Sandberg's offensive output declined, he was still formidable at the plate. Sandberg hit .284 with 14 home runs, 76 RBI, and 68 runs while stealing 34 bases. In fact, his '86 campaign marked a five year string of stealing at least 30 bases. Additionally, Sandberg cut down on his strikeouts (from 97 to 79), lowering his K/AB from 15.9% to 12.6%. Before the '87 season, the Cubs signed Andre Dawson to a free agent contract. For the next 5 years, Sandberg and Dawson would form the core of the Cubs offensive attack. In addition, Sandberg began racking up mile-stones in his '87 campaign, including his 1000th career hit on August 7th off of Ron Darling. The 1988 Chicago Cubs featured one of the greatest collections of young talent ever to play in Chicago. While Sandberg, age 28 was entering his prime, and Dawson, 33 had peaked with 49 home runs in his MVP year in '87, the Cubs also had a 22 year old right hand pitcher named Greg Maddux, as well as 25 year old Southpaw Jamie Moyer. In the outfield, Darrin Jackson age 25 played along side, 23 year old Rafael Palmeiro. The infield also included shortstop Shawon Dunston age 25, and a 24 year old first baseman named Mark Grace. During the '88 season, Sandberg showcased his best blend of power and speed since 1984. Stealing 25 bases and hitting 19 home runs, Sandberg scored 77 times and drove in 69 RBI. Although his batting average faltered to .264, Sandberg continued his excellent work in the field, becoming the first secondbaseman in National League history to win 6 consecutive Gold Gloves. Again, the fans of baseball recognized Sandberg's great play by electing him to start his 3rd All-Star game, and sending him for his 5th consecutive trip. Also in '88, Sandberg hit his 100th career home run on June 19 off of Montreal's Neal Heaton. In 1989, surrounded by a stellar, young cast, Sandberg transformed his style of play from a speedy second basemen with some power, to a powerful second bagger with speed. Despite the change in offensive emphasis, Sandberg's fielding didn't falter, but continued to improve. Hitting his peak in '89, Sandberg hit 30 home runs for the first time in his career, while stealing 15 bases, and improving his batting average to .290 (tenth best in the NL). With the Cubs en route to their second division title in six years, Sandberg drove in 76 runs and scored a league high 104 runs. No other secondbaseman had hit 30 home runs since Bobby Grich in 1979, a decade before. In the 1989 NLCS, Sandberg continued his excellent post-season hitting, batting .400 in 5 games against the Giants, including a home run, 4 RBI, 6 runs scored, a triple, and 3 doubles. Ryno also walked 3 times, giving him a .550 OBP for the series, and an .800 SLG % (or .1350 OPS). Alas, Sandberg and Mark Grace (who also posted tremendous numbers) couldn't get the Cubs past San Franscisco's Will Clark, Matt Williams, Kevin Mitchell, and Bobby Bonilla. As in the previous 6 years, Sandberg was again an All-Star in 1989, starting in his 4th game for the NL. In the end of year awards voting, Sandberg finished 4th in the MVP race, and won another Rawlings Gold Glove award (7th straight), as well as his fourth Sporting News Silver Slugger award. With high expectations for the Cubs again in 1990, Sandberg continued dominating the National League. Despite another season of injuries which kept the team from competing in the NL East, Sandberg led the National League in Home Runs in 1990. With 40 round trippers, Sandberg became the first second baseman to lead the league in home runs since Rogers Hornsby in 1925. Additionally, Sandberg's 40 home run season was the third highest single season mark for a second baseman, behind Hornsby (1922) and Davey Johnson (1973). In addition to leading the league in home runs, Sandberg also lead in runs scored (116) and total bases (344). His SLG % (.559) was second only to Barry Bonds. For the first time in his career, Sandberg drove in 100 runs, primarily from the second spot in the batting order. With 25 steals, Sandberg also racked up his 7th season with at least 25 steals. 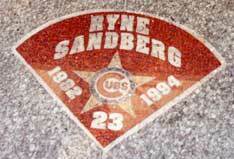 In July 1990, Sandberg was the unofficial host of the All-Star game, which was held at Wrigley Field. He was the leading votegetter for the NL, starting his 5th consecutive All-Star game, and appearing for the 7th time. At the home run derby, with the wind howling in off of Lake Michigan, Sandberg won the derby for himself and the National League by hitting three home runs under the jestream into the left field bleachers. In the post-season voting, Sandberg was again 4th in the MVP voting, and won another Gold Glove and Silver Slugger. Ryno also recorded two more career milestones during the 1990 campaign. On June 2nd, Sandberg hit his 150th home run, and then recorded his 1500th career hit on June 29 off of San Diego's Greg Harris. In 1991, Sandberg had his second consecutive season of 100 RBI's, and scored 104 runs, while hitting 26 home runs, and batting .291. No other second baseman had driven in 100 RBI's for two consecutive years since Bobby Doerr in 1949, and his 104 runs (3rd in the league) marked his third consecutive season of at least 100 runs, and the sixth of his career. In the field, Sandberg had the best season of his career, committing only 4 errors during the season, and ending with a .995 fielding percentage. At the All-Star break, Ryno was again voted to the NL squad, this time leading the Major Leagues in votes. He started for the 6th consecutive time, and 7th in total during 8 appearances. After the season, Sandberg won his 9th consecutive (and final) Gold Glove, and his sixth Silver Slugger award. During the 1992 season, Sandberg hit .304 while smashing 26 home runs, driving in 87 and scoring 100 runs. Sandberg's 26 home runs tied him with Hall of Famer Rogers Hornsby for the most 25+ Home Run campaigns among second basemen at 5. His 100 runs, 4th best in the NL, marked the seventh time in his career and fourth consecutive year that Sandberg had scored at least 100 runs. Ryno also finished the '92 campaign second in Total Bases among national leaguers, third in hits, and 5th in SLG and extra base hits. "I lost a string of nine straight Gold Gloves in 1992. That in itself didn't bother me. But the way I lost it did bother me. There seemed to be a campaign going on for Pittsburgh's Jose Lind, which was fine because he was terriffic that year. What bothered me were the shots bein taken at me, because I didn't understand them. That's when I began hearing I had lost some range. Well, who doesn't after 15 years as a pro? But how much could I have lost if I led the majors in assists and the NL in total chances? It was just kind of strange. I played in 30 more games and had 100 more assists than Lind, and I played with seven different shorstops that year - Shawon Dunston, Rey Sanchez, Jose Vizcaino, Luis Salzar, Alex Arias, Jeff Kunkel, and Gary Scott." At the All-Star break, Sandberg was again elected by the fans to start at Second for the Senior Circuit. Sandberg lead all other NL players in votes for the third year, and marked his 7th consecutive All-Star Game start (9th straight appearnce). While Sandberg earned yet another Silver Slugger (his sixth), Jose Lind of the Pirates won the Gold Glove at second despite having 111 few assists, 85 fewer Total Chances, and only a .002 margin in fielding percentage. Ryne Sandberg's 1993 season started late. In the first spring training game of the year, San Francisco's Mike Jackson threw an inside pitch which pinned Sandberg's left hand against his bat and broke his hand, causing him to miss all of spring training and the first month of the season. In addition to his second stint on the DL, Ryno was also struggling with a team that seemed foreign to him. The Tribune Company had hired Larry Himes to replace Sandberg's mentor Jim Frey as general manager. Himes proceeded to clean house, allowing Cy Young winner Greg Maddux to leave (by neglect) on the free agent market. Himes also refused to negotiate in good faith with Andre Dawson (who had signed a blank contract in '87 to overcome collusion and play for Chicago) and Rick Sutcliffe (who with Ryno were the only Cubs left from the '84 NL East championship team.) When he wrote his autobiography in 1995, Sandberg titled the chapter about his 1993 season, "The Summer of Torture." When Sandberg returned April 30th, he struggled to catch up with the rest of the league which had a two month head start. On May 5th, he made his first throwing error since July 4, 1990 ending a streak of 393 consecutive games and 1,298 assists without a throwing error. On May 26th, a frustrated Ryno was called out by umpire Charlie Williams (it was a really bad call, I remember this game vividly) at first base. After asking Williams "what he was looking at?" Sandberg was ejected for the first time in his career. However, as Sandberg began to catch up with the rest of the league, he began performing as he had in previous years. On July 3rd, Ryno notched his 2,000th career hit of Curt Leskanic who was pitching for the Rockies. Over his final 25 games, Ryno was red-hot, batting .347 and reaching safely 24 out of 25 games. However, his season was cut short when he dislocated a finger on his right hand September 13th. 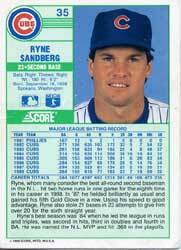 Despite his late start, Sandberg finished '93 with a .309 AVG with 9 HR, 45 RBI, and 67 runs in 117 games. Sandberg also made the final All-Star appearance of his career when he was again elected to start for the National League. It was Sandberg's 10th straight All-Star invite, 9th start, and 8th consecutive start. With his election, Sandberg became the first second bagger to start 9 All-Star games. "Himes often told coaches and managers that he didn't care about what players were like in the clubhouse. He cared only about what they did on the field. I guess he didn't realize the two go hand in hand. He brought in veterans with baggage and they poisoned the clubhouse, especially the younger gids, making them difficult to manage and difficult to get along with. But what difference did it make to Larry? He didn't have to live with them. Apparently he didn't realize that it eventually destroys a team and would hurt him as well... You have to look inside the individual." "The one thing that always kept me going, winter after winter, was the hope of getting to a World Series. That winter however, I didn't think about it. Deep down, I knew what our chances were. In my head, over and over again, I was asking myself this question: How many more years do I want to do this? When that hits you, its a shock. At least for me it was, because I thought for sure I'd play another three or four or five years. But once it hits you, it's real and you can't get rid of it. What you're not aware of is that once the doubt enters your mind - at that precise moment - you're done. You've already given in to the feeling. I fought if for a while, but then I had no choice but to accept it, and the next step was putting a time frame on it." Entering the 1994 season, Sandberg, Mark Grace, and Shawon Dunston were the only remaining Cubs from the 1989 NL East division championship team. Sandberg had played for 8 managers in 12 seasons with the Cubs, and was starting on #9. He had watched the general manager dismember a team Sandberg believed was on the verge of winning again after the '92 season, and replaced many of his friends with players Sandberg felt approached the game unprofessionaly. Having already decided to retire after the 1994 season, Ryno got off to a horrible start and never found the motivation to snap out of it. 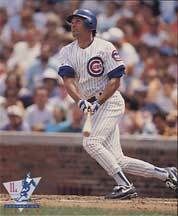 After only 57 games, Ryno decided that he was miserable playing baseball for the Chicago Cubs and decided to retire on June 13th, 1994. At the time, Ryno was batting .238 with 5 home runs, 24 RBI's and 36 runs scored. Following Sandberg's suprise retirement, many rumors swirled about Ryno's motivation for retiring. To answer these questions, and to reflect on his career, Ryno wrote a book "Second to Home." Some of the rumors about his retirement included the following: he had AIDS, he was hired by NASA , he was leaving to join the circus, and he was going to go play point guard for the Phoenix Suns. While these rumors were truly outlandish, many people believed that Sandberg had retired in an attempt to save his marriage. In fact, 10 days after Sandberg's retirement he and Cindy (his wife of 15 years) "split up". However, Sandberg insists that this was not the case, and that he didn't even know that his marriage was ending when he retired. Ryno simply says that he wanted to be home with his kids (Lindsey and Justin) and had lost his desire to play baseball. Although this is difficult for an adoring public to accept, I have no reason to doubt Sandberg, and he doesn't really have any great incentive to fib, so I accept it. During his retirement, Ryno remarried to Margaret Koehnemann, his second wife. Then, in 1995, Sandberg attended the final home series of the year at Wrigley Field. The Cubs were still in contention, and Sandberg realized how much he missed the game. On October 31, 1995 Ryno announced that he would return to play second base again for the Cubs beginning in 1996. With a new general manager, (Larry Himes had been demoted to scout in October 1994 and replaced by Ed Lyncy when Andy McPhail was hired as team President), and another new manager (Jim Wriggleman), Ryno began his comeback. Although he hadn't played in a year and a half, Sandberg performed well in 1996, hitting 25 home runs (to give him the most 25+ home run seasons by a second baseman), driving in 92, and scoring 85 runs while stealing 12 bases (at the age of 36!). However, his retirement had frayed his ability to make consistent contact. Ryno hit a career low (for a full season) of .244 and struckout a career high 116 times (one of only 2 100+ strikeout seasons). During the second year of his comeback, Ryno improved his contact hitting and raised his average twenty points to .264. However, in reduced action, Ryno only hit 12 home runs, driving in 64 and scoring 54 times in 135 games. Although he strugled at the plate, Ryno surpassed many career milestones in his final year. During the '97 season, Sandberg surpassed Joe Morgan for the all time lead in home runs by a second baseman (277) (he has since been surpassed by Jeff Kent on October 3rd, 2004), he also recorded his 1,000th RBI, and 1300th run, and 400th double. After taking a year off to enjoy retirement, Sandberg began serving as a spring training instructor for the Cubs in 1999, and has done so for five years now. He has remained active with the organization, appearing at the Annual Cubs convention every year, and attending games on occasion. In 2002, after the Cubs had decided not to bring Bruce Kimm back, Sandberg contacted new General Manager Jim Hendry and offered to manage the Cubs in 2003. Although Hendry declined (and hired Dusty Baker), Sandberg has noticably increased his presence in the baseball world. In both 2002 and 2003, Sandberg played in the Celebrity All-Star softball game before the Home Run Derby (he hit a dinger in '03, but wasn't there in '04... I don't know why.) Ryno also took a turn in the TBS broadcast booth April 10th, 2004 as a guest color commentator, and has been working as a baseball expert for ESPN 1000 (radio) in Chicago. After dominating his position for 11 years, and posting the most impressive combination of speed and power (not to mention defense) of any second baseman in history, Sandberg was elected into the Baseball Hall of Fame in Cooperstown. On his first year on the ballot, Ryno received 244 votes out of 496 votes (49.2%), which was well shy of the 75% threshold. Sandberg accepted his snub in his typically gracious manner by saying: "I did everything on the field and had a great time doing it. I enjoyed every minute of it. If something happens in the future like the Hall of Fame, it's totally out of my hands. It's just nice to be thought of. ... It's really an honor." When the Baseball Writers Association of America voted again in late 2003, Sandberg received 309 votes out of 504 (61.1%) again, shy of the cutoff. However, in his second year on the ballot, Sandberg received the highest number of votes for a player who was not elected. Finally, on his third chance, Sandberg was elected to the Hall of Fame in 2004. He received 393 votes out of 516 ballots. This vote was an increase of 84 votes and 15%, pushing him over the 75% level by six votes. With 76.2% of the vote, Ryno and Wade Boggs formed the HOF class of 2005. On July 31, 2005, Ryne Sandberg was inducted into the Baseball Hall of Fame in Cooperstown, New York. Sandberg's hall of fame inductance speech was widely hailed as one of the best of all time, and immediately established Sandberg as a true statesman of the national pastime. Sandberg's speech urged ball players and everyone involved in MLB to "respect the game above all else." Since his second retirement, Sandberg has been active as a Cubs coach. After several years as a spring training instructor, Ryno requested to be considered for the Cubs managerial opening. Even though Jim Hendry hired Lou Piniella, Hendry offered Sandberg the vacant Peoria Chiefs managerial position, and Sandberg accepted. In his first season as Peoria Chiefs manager, Sandberg received high praise from the organization and his players. The Chiefs finished 2007 with a 71-68 record. Despite struggling in the first half of the season (31-38), the Chiefs refused to quit and finished with a 40-30 record, good for a first place tie over the second half of the season. After some discussion, Sandberg will return to coach Peoria again in 2008. One of my most prized possessions is a signed Ryne Sandberg Baseball Card. He sent it to me after I sent him a leather bracelet with "Ryno" on it that I made at Summer camp. He signed it later when I attended a game and waited by the players parking lot to get it signed. Luckily, my older brother got the assist and got it over the fence while I was getting smushed up against the chain link fence. Ballplayers have been idolized by young kids since God started letting men be Ballplayers. I am fortunate to have idolized both a great player and a great person. Everytime I have gotten the opportunity to attend a function with him, he has always conducted himself with dignity and grace... some of my prominent Ryno memories. ... in 1990 when Ryno hit 40 homers, I was so mad at Cecil Fielder for hitting 50. I wanted Ryno to be the major league leader so badly, I would have hit 11 myself if I had gotten a couple of hacks for him. ... Ryno won the homerun derby. Looking back and realizing he only hit 3 puts a damper on it, but at the time I was so proud that he was the only one who was able to hit three out of Wrigley, just because the wind was blowing in. ... watching games in the middle of the summer on WGN, putting off my chores until Ryno batted. I didn't care if the house was burning down, there was no way I'd turn off the TV until after Ryno had batted and scored, or been retired. 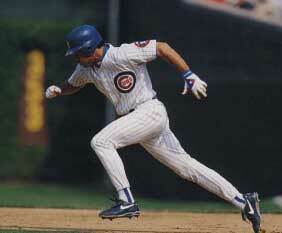 ... Ryno snapped his 125 game errorless streak by throwing the ball past Mark Grace. I was watching the game, and almost started crying because I didn't want him to lose the streak. ... Ryno got ejected. One of the things that I always thought was the coolest about him was that he had never been ejected from a game. I always wanted to argue with the umps in little league, and I saw guys like Andre Dawson who would occasionally throw a bucket full of balls on the field when they got run. I always thought it was so classy that he had never been ejected, and then when he was... I was happy for him because he was slumping and the ump totally blew the call. ... Ryno retired. I was at summer camp (not the time I made the Ryno bracelet), and we were in the pool room. I saw the top of the sports section and it said that Ryno had retired. I didn't really believe it because it seemed so surreal, but when I got home and it was confirmed by my actual paper, I think I cried. It was horrible. ... Ryno unretired. When I was young, I delivered newspapers. One of my favorite spots was the "Moose Lodge" because they would always give me a Coke in a plastic cup, and I would take a breather half way through my route... (and they typically had the game on the TV). Well, one day I was running late and the evening news was on, with Ryno smiling at a press conference saying he was coming back. I ran all the way home (didn't finish my paper route) (actually) crying tears of joy. I turned on the TV and watched about 1:30 of news to hear it reported again and again. ... Spring training 1996. I have never been so excited for a season to begin. Everyday, there was an article about Ryno's return and his progress, (Kind of like Prior Watch 2003). When the season finally got here, I was so proud that Ryno could hit 25 home runs after taking a year and a half off. ... Ryno retired again in 1997. When I was a kid, I didn't get to more than 1 game per year (2 if I was really lucky, 0 if not.) Well, I went to a game with my Mom on August 20, (I have a picture of the marquee - not a freaky memory) and figured that would be it for the year. Well, about four days after we went, the Cubs announced that September 20th would be Ryne Sandberg day. Fortunately, my Mom took me to that game too(with a little begging, but thanks Mom). Although the Cubs lost, and Ryno really stunk it up, I was so relieved to have made it to his game. I can remember thinking at the time how I would have never forgiven myself if we hadn't made it. I still have my ticket stub. Ryne Sandberg is also one of the eight or 10 greatest players at his position -- which makes him a Hall of Famer, too -- though of course he gets there in an entirely different way. Looking at Bill James' Win Shares, Murray never got more than 33 Win Shares in a single season. Sandberg, on the other hand, had three seasons with more than 33 Win Shares, including seasons with 38 (1984, his MVP season) and 37 (1991). -Rob Neyer, ESPN.com — "Murray, Sandberg deserve election." Ryne Sandberg. No question in my mind. The best player at his position for more than a decade, and probably the best in the league for at least part of that time. Critics scoff that his numbers wouldn't be so hot if he played any position other than second base, but that's a specious argument: a second baseman is part of the lineup, and a second baseman who swings the bat the way Sandberg did makes a team that much stronger. -Dan McGrath, Chicago Tribune Sports Editor — "McGrath: Pick 5"
Since Sandberg's vote percentage jumped from 49 to 61 last year, it's apparent he'll get elected one of these years. But it's absurd that it's taken this long. Until last September, when Jeff Kent passed him, Sandberg led all second basemen in history in home runs (277). He owns the highest fielding percentage (.989) of any second baseman since 1900. He's the only second baseman ever to start nine All-Star Games. And from 1982-92, he led all second basemen in average, homers, RBI, runs, extra-base hits, OPS, fielding percentage and 500-assist seasons. So about all he didn't do was bake the pizzas at Geno's. -Jayson Stark, ESPN.com — "The Great Eight"